I’d always envisioned my first book launch to be at Kepler’s ever since I was an English major in college. When I visited during college breaks, my friends and I would beeline to Kepler’s, browse the bookstore, and indulge in frosted mochas next door at Cafe Borrone. 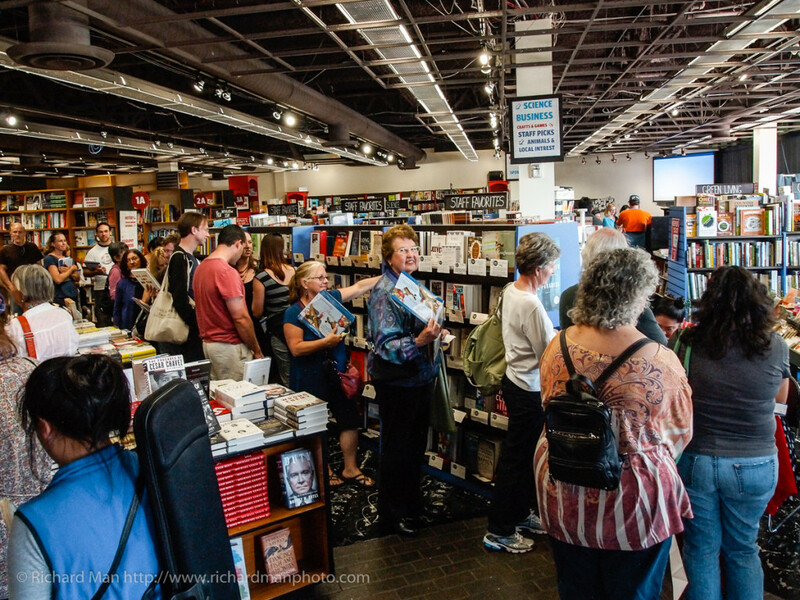 As an adult, I love going to Kepler’s author events, and often visualized myself there one day. 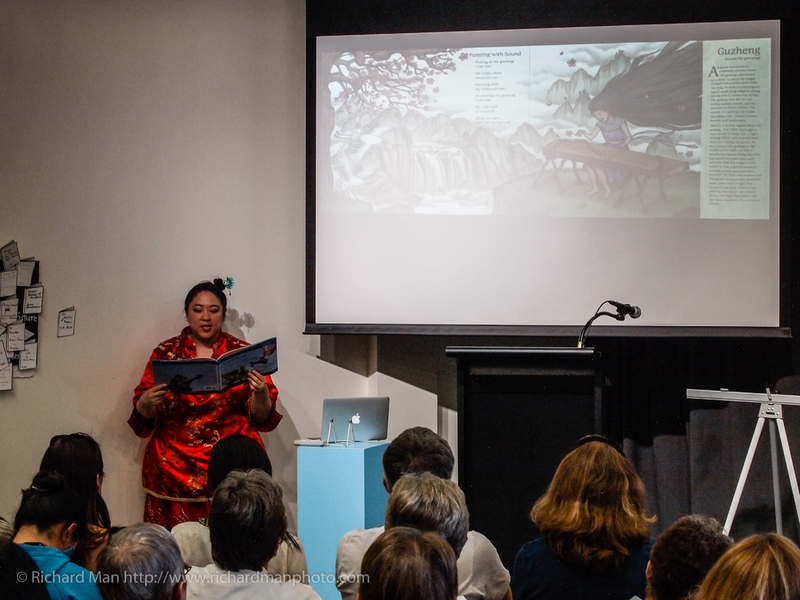 So imagine my excitement when I finally sold a picture book! One of the first things I did was inform Angela, the Youth Events Manager at Kepler’s, and her immediate response was, “We’d be happy to launch your book!” It was the first step to my dream coming true. The road to achieve my dream of publication was not completely smooth, nor all that predictably. My book was delayed indefinitely, then was acquired by a wonderful new publisher in Lee & Low, so in the end, I’m very grateful for everything. 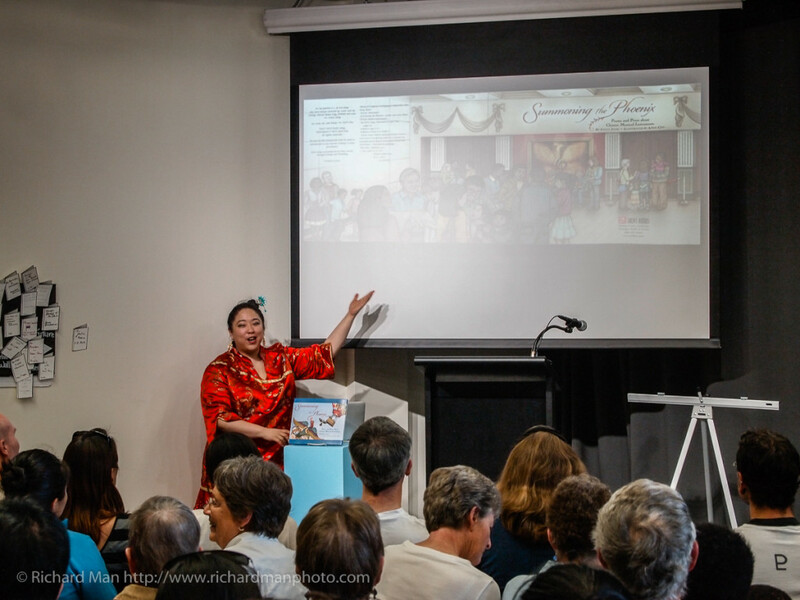 I had a similar experience with my actual book launch at Kepler’s. There was just so much going on that day that I had made a timeline that meticulously outlined where and what I needed to do every 15 minutes. Nothing went according to schedule, yet everything somehow worked out in the end. It started with the cake. I had purchased a cake transfer, and the decorator at the local Safeway inexpertly applied it so that the cover was wrinkled. Thankfully you can’t tell in my picture unless you see very closely. But ultimately, you can read the words and see Aprils beautiful artwork clearly, and that’s what matters most. That and it happens to be red velvet cake, which is April’s favorite as well as mine! 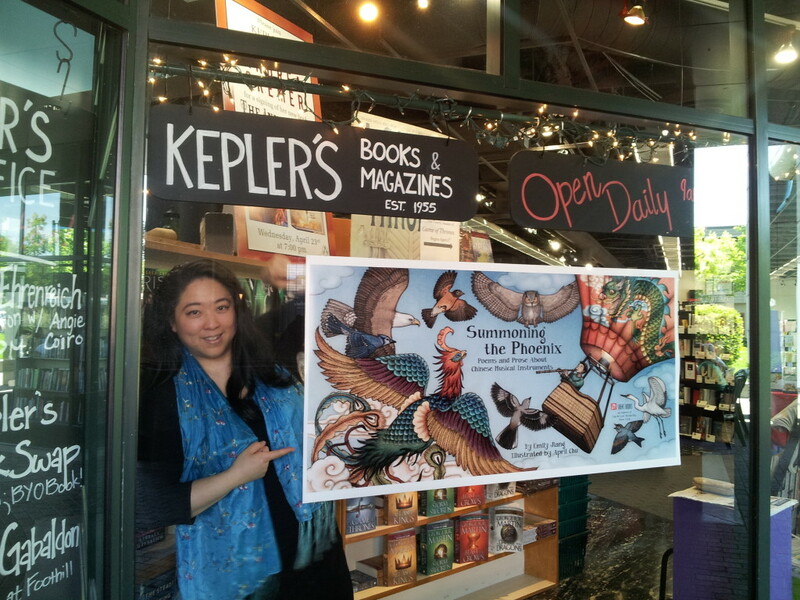 When I entered Kepler’s they had already set up a wonderful display table of Summoning the Phoenix right in front. It’s literally the first thing you see when you enter the store. April and I added the postcards, book marks, and stickers that April so beautifully designed. A wonderful group of my friends gathered for a leisurely brunch before my party. They even moved it earlier so I could attend, and we gathered three or four tables in a cozy corner. Mostly I dropped by to say hi and hug people as they arrived while I was running around setting up for the party. 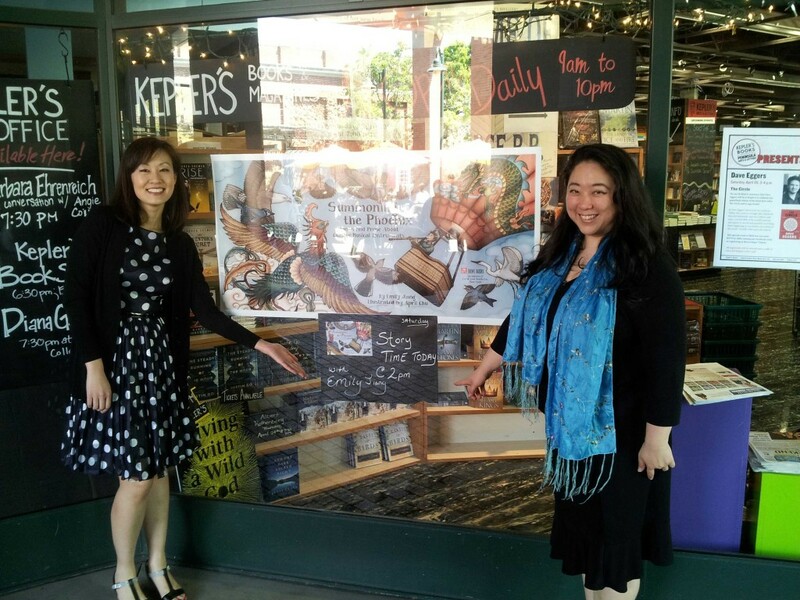 The staff at Kepler’s is so awesome and totally joined me into all sorts of fun last-minute promotional tasks, like putting my giant poster of April’s art in their window. The glare on the window was a bit tricky, but I kind of like how the picture below looks like the banner is on fire, just like a phoenix! April & Emily pointing to their new huge window display at Kepler’s! Photo by Steve Chien. 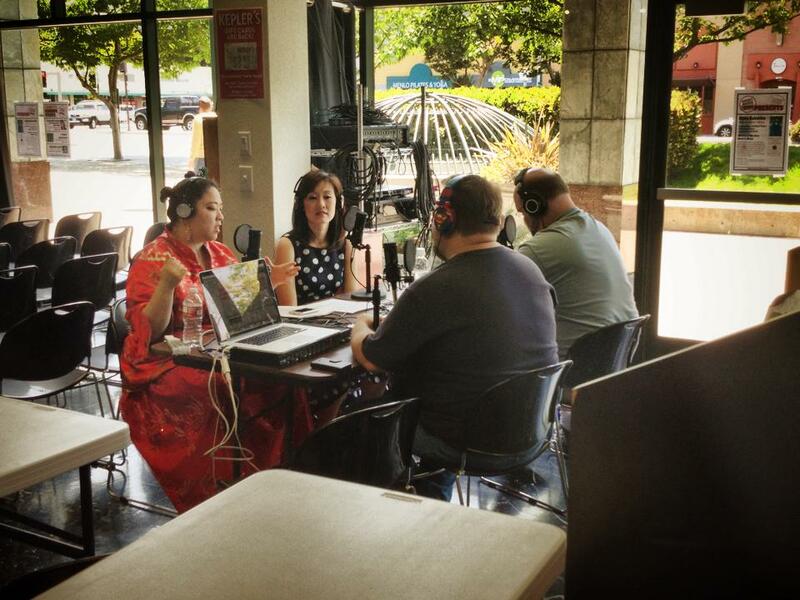 Then the kind Kepler’s staff allowed me to change in their private space, and I donned my red Chinese-inspired costume just in time to be interviewed by JC and Chuck of The NerdVana Podcast. Emily & April being interviewed by JC & Chuck of The NerdVana Podcast. Photo by Nathan Kopp. The interview was quite fun. April noticed that I had typed out my answers, to which I said, “I’m a writer.” But in the end I ended up improvising because it’s difficult for me to keep to a script when I’m actually talking to people in person. At the very beginning of the session, I dropped my phone, and lost my script, so again I improvised. Then technical difficulties with the projector at the very beginning gave me an opportunity to interview the five young musicians from the California Youth Chinese Symphony. They ranged in ages from 6 to 13, and they were very sweet and a little shy. These kids are super talented! 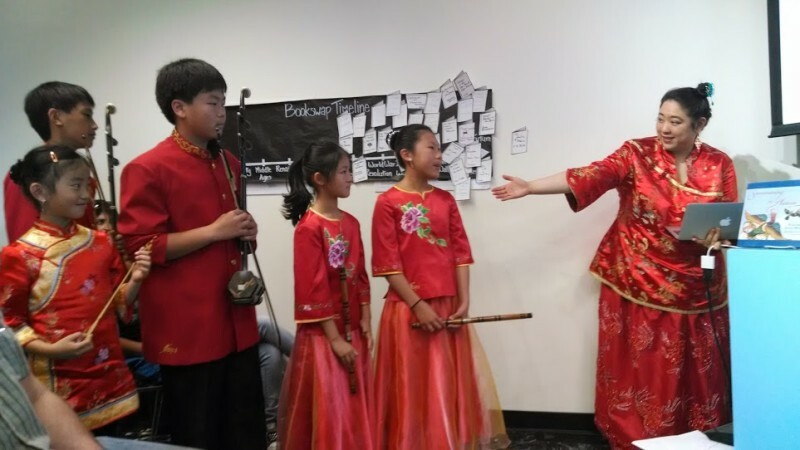 Emily introducing the young & talented musicians of the California Youth Chinese Symphony. Photo by Adam Lasnik. the joys of music right now. Thankfully, Jennifer’s awesome husband was able to fix the connection between my laptop and the projector. Whew! So I read from the book and flashed the corresponding pages onto the big screen. Author Emily introducing the title page of Summoning the Phoenix. Photo by Richard Man. 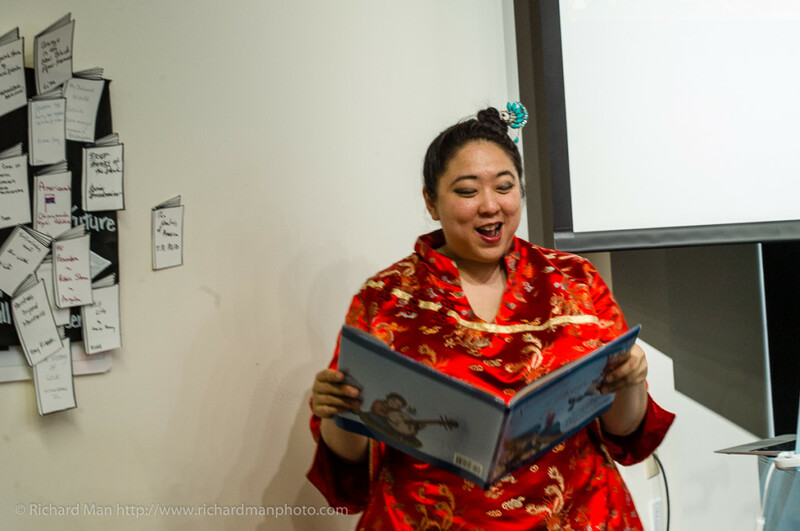 Author Emily Jiang reading her poem “Painting with Sound” about the guzheng. Photo by Richard Man. 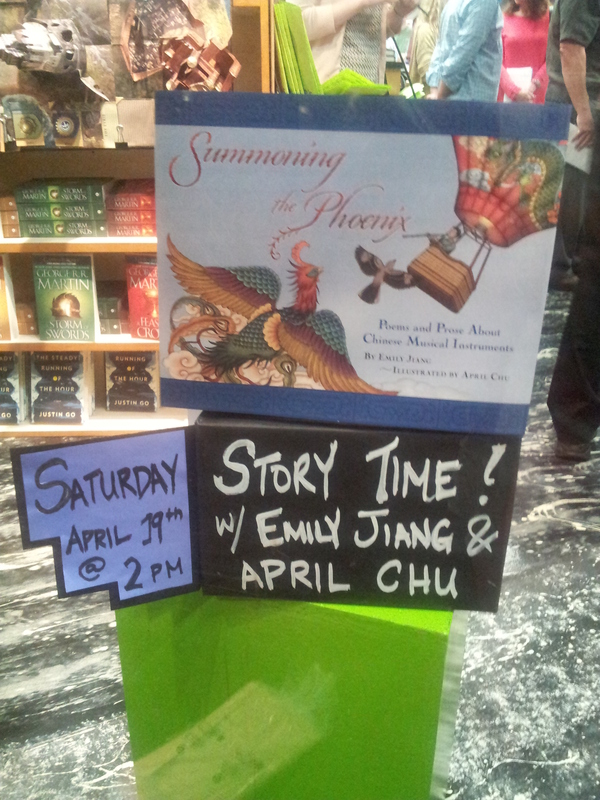 Author Emily reads from her book Summoning the Phoenix. Photo by Richard Man. 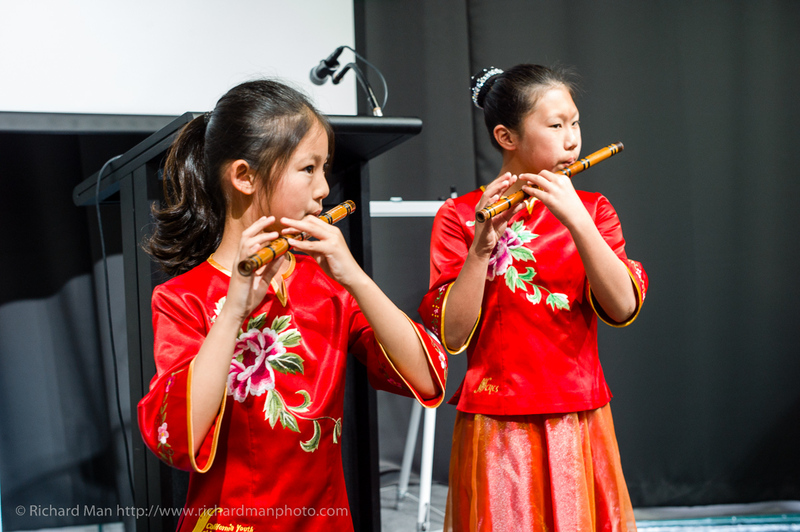 After I spoke, Elaine and Emily (not to be confused with the author) played the dizi (or bamboo flute). They played together, then Elaine, picture alone below, played a solo. Elaine & Emily play a fun duet on the dizi in the key of G. Photo by Richard Man. Elaine playing a lively solo on the dizi in the key of F. Photo by Richard Man. 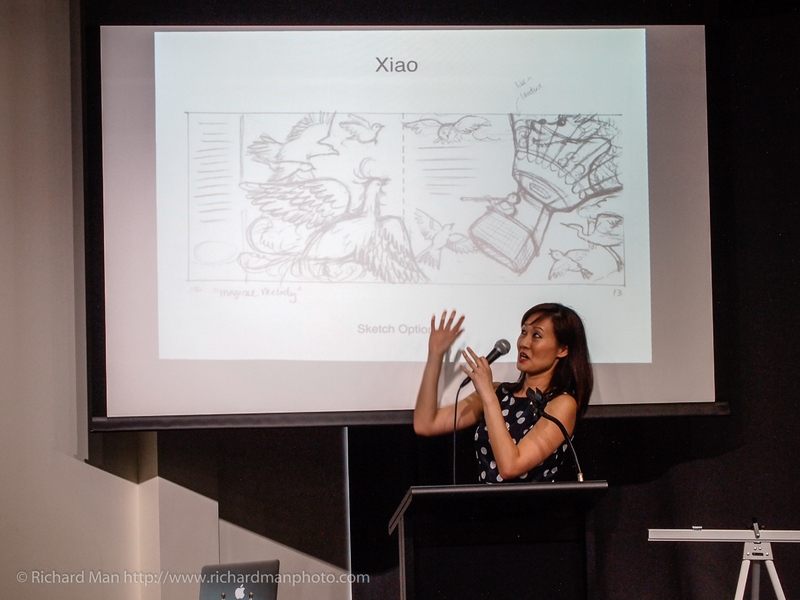 Then April gave an excellent talk about her illustration process. 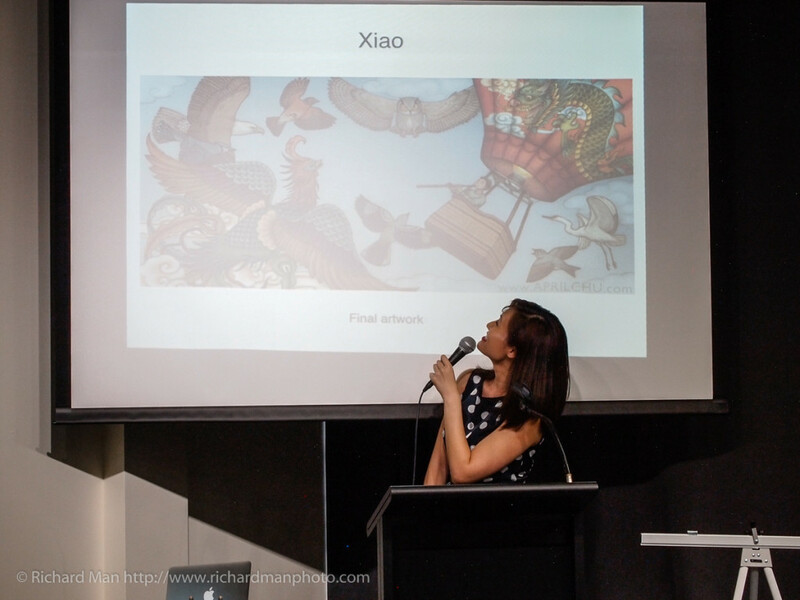 My favorite one was how she came up with the xiao illustration, which was also the artwork for our book’s cover. You can just see how it evolves from her sketches. 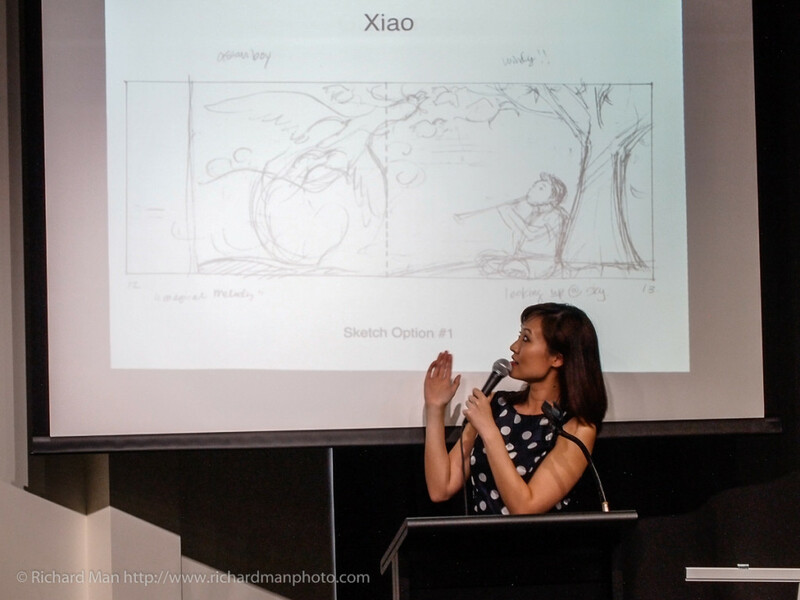 April introduces her original sketch for the poem “Magical Melody” about the xiao. Photo by Richard Man. April discusses her revised idea for “Magical Melody.” Photo by Richard Man. April reveals her stunning final art for “Magical Melody.” Photo by Richard Man. 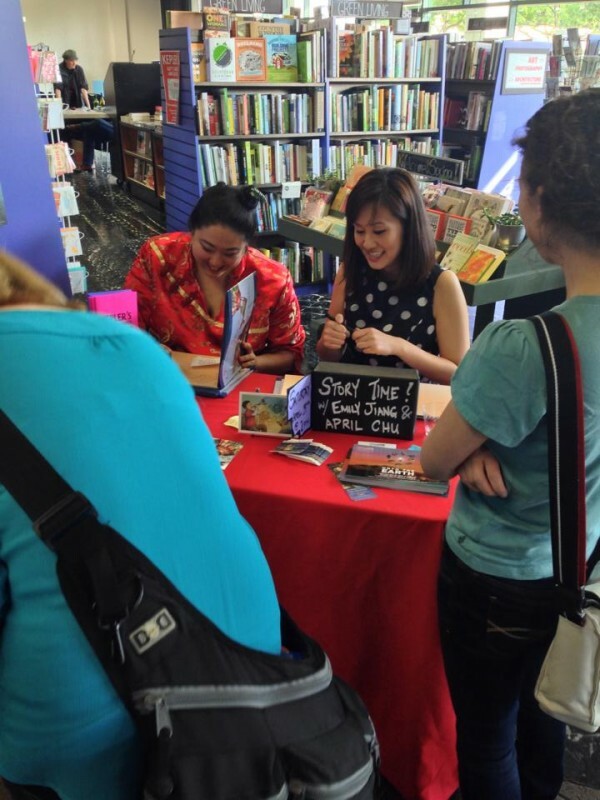 After April’s presentation, we announced that we would take a musical break during which April and I would quickly sign books. 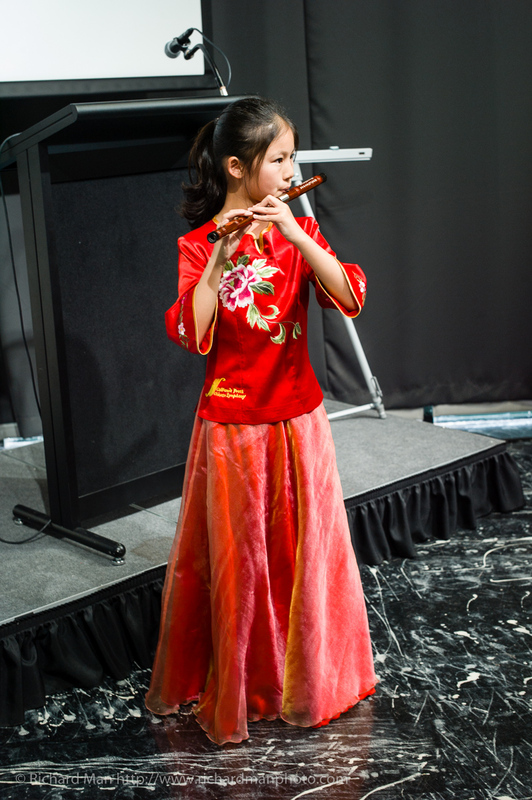 Then we would return to the stage for a quick Chinese folksong performance and Q&A. This was the plan. April and Emily agreeing to the plan of returning to the stage after what was supposed to be a quick signing. Photo by Richard Man. 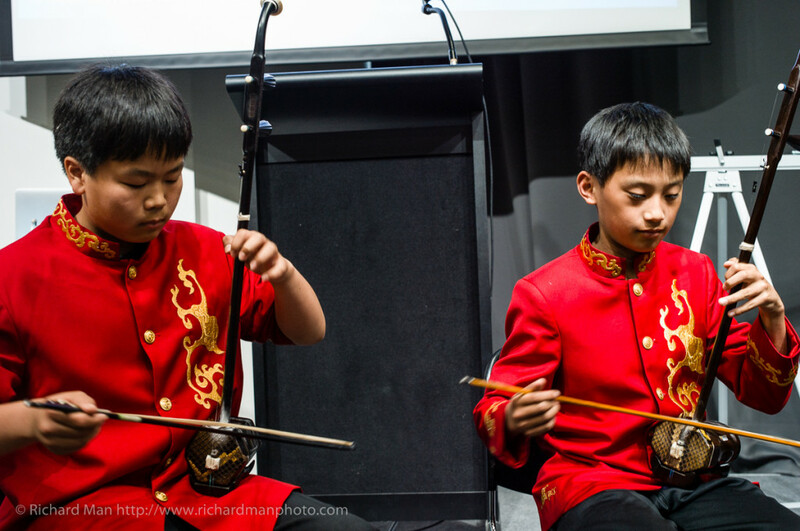 Bill & Justin concentrating hard on playing the erhu. Photo by Richard Man. Maggie is so poised at the yanqin. Can you believe that this is her first public performance? Photo by Richard Man. 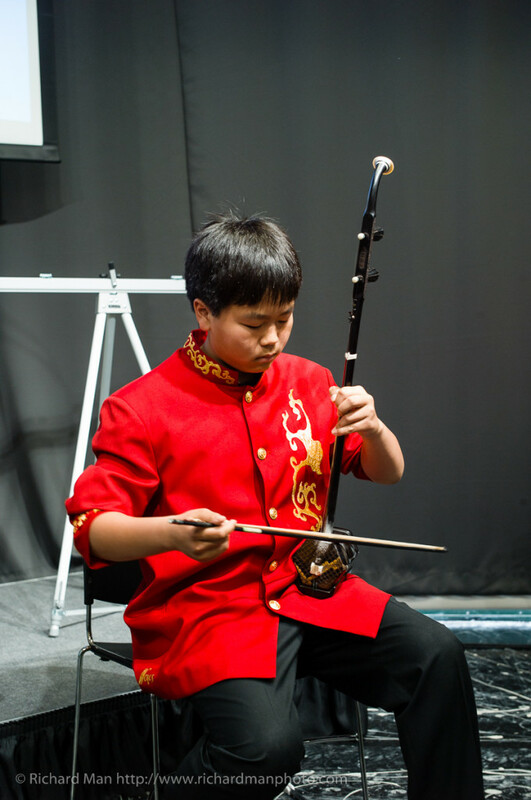 Bill’s solo on the erhu was excellent. Photo by Richard Man. 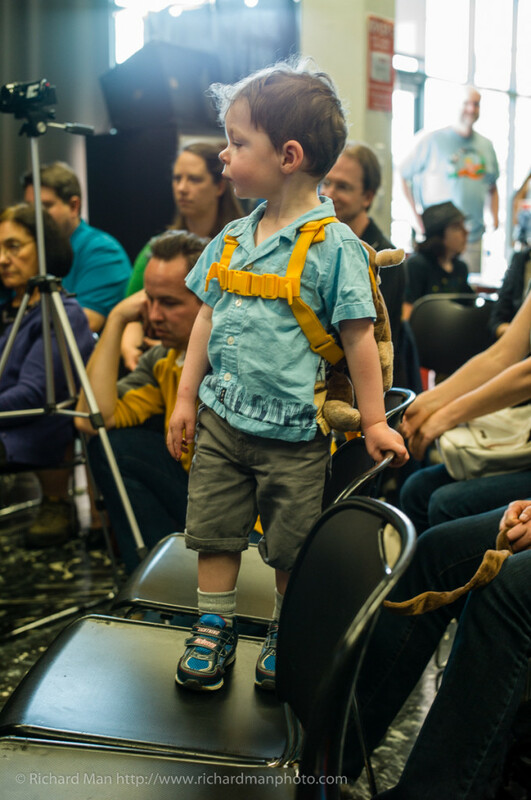 The kids played so well that little Jack stood on his chair, absolutely mesmerized by the music. 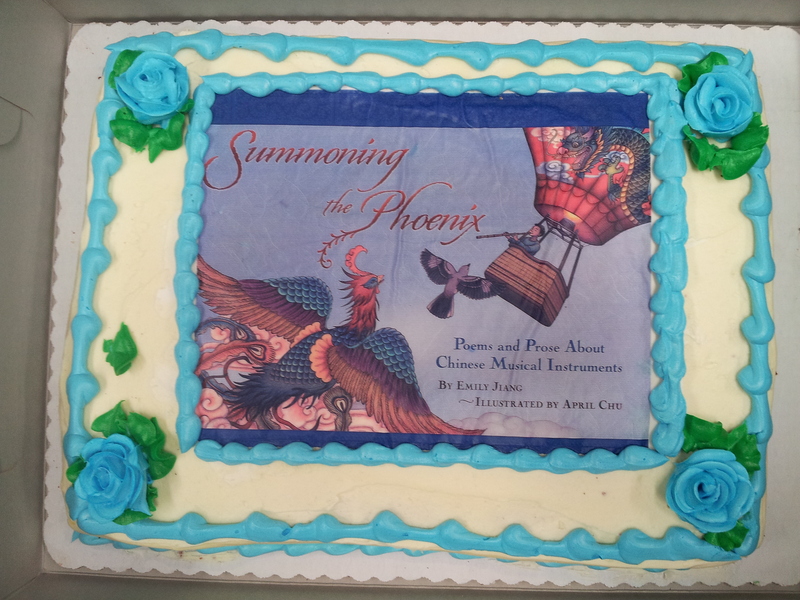 His mom, one of my dear friends, bought copy of Summoning the Phoenix for his birthday. I predict there’s music lessons in his future! Look at that long line of awesome people! Photo by Richard Man. Emily & April figuring out their autographing system. Photo by Jeff Kellem. April and Emily discovered that they were signing the same things! 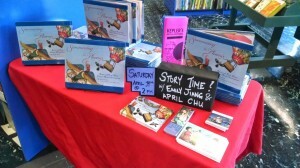 Also, Emily had to hold each book up because there wasn’t enough space at the table for 2 flat books. Photo by Richard Man. 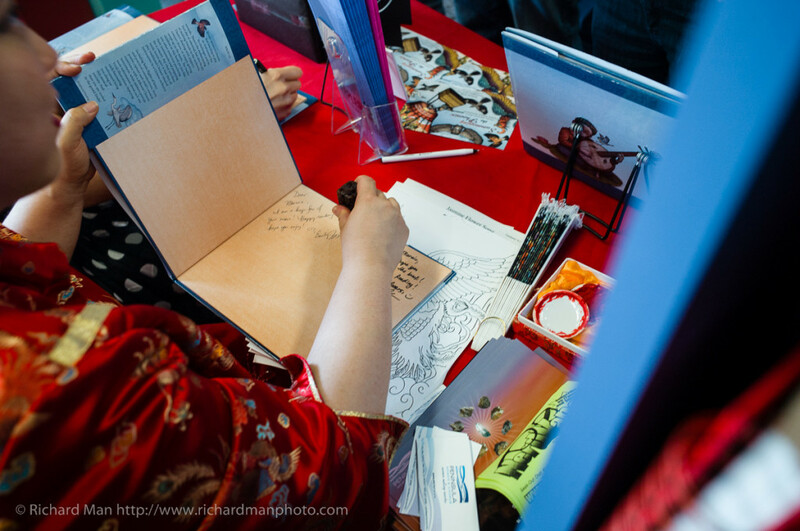 A peek into how Emily uses a chop to sign! Photo by Richard Man. Note this is 1.5 hours past our scheduled finish time, so in the end it was a good thing that we skipped the Q&A and continued signing. Because I was also using a chop (which I had hand-carved in China), I got red ink all over my fingers. Then my pen exploded, and black ink stained my palm. My hands were a black and red mess, but I kept signing. After two continuous hours, my right hand, which is my signing hand, actually started cramping! Ouch! But it was so worth it, taking the time to personalize my inscription for each and every book. Because out of the autographing line, there were only a handful of faces that I did not recognize. Pretty much everyone at Kepler’s was there for me, and I wanted to show them how much I appreciated their enthusiastic love and support. 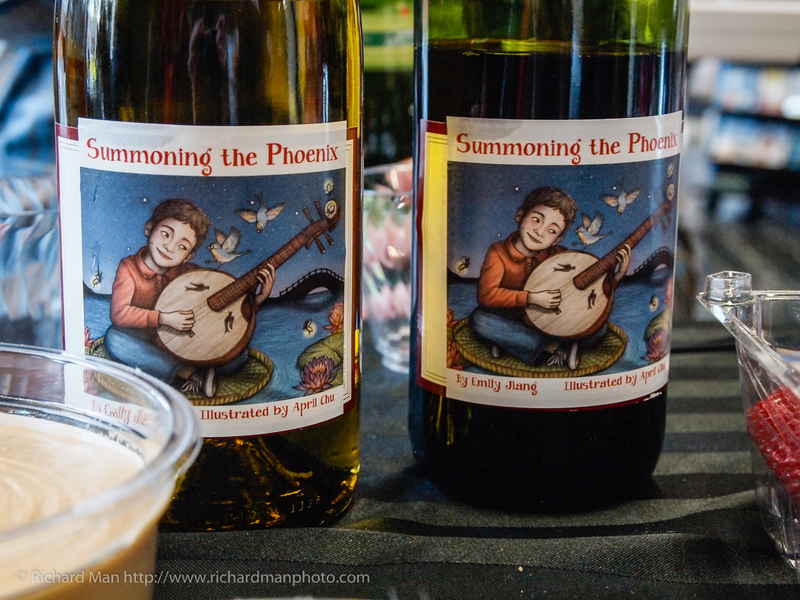 I’m a little sad I didn’t get to sample any of our Summoning the Phoenix wine that April so cleverly branded, but there’s always the next party in Berkeley! 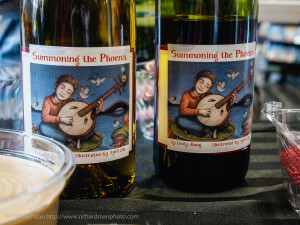 Look at the awesome wine that’s cleverly branded Summoning the Phoenix! Photo by Richard Man. Finally, here is what I was planning to say in person at the very end of the Q&A that did not happen because of the large signing line. Thank you to the awesome staff here at Kepler’s: Angela, Cressida, Chelsea, Cynthia, Kirsten, Leigh, Maggie, and Michael. They worked so hard to help promote this party and set up these wonderful posters and displays and projector and tables and chairs. They are, quite simply, awesome! It’s been my dream to have a book launch at Kepler’s and I hope it will continue to be a dream for future debut authors. But it will only happen if we continue to support them! 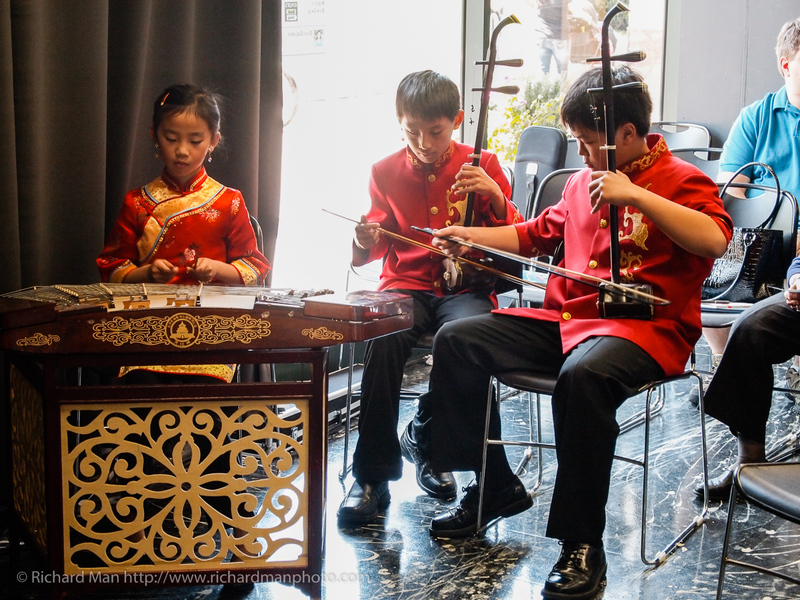 I’d like to give a final thank you and round of applause to the wonderful student musicians from the California Youth Chinese Symphony and their teacher Duny for helping to organize their schedules so they can make it to our party. I hope you kids keep playing because you are SO talented! 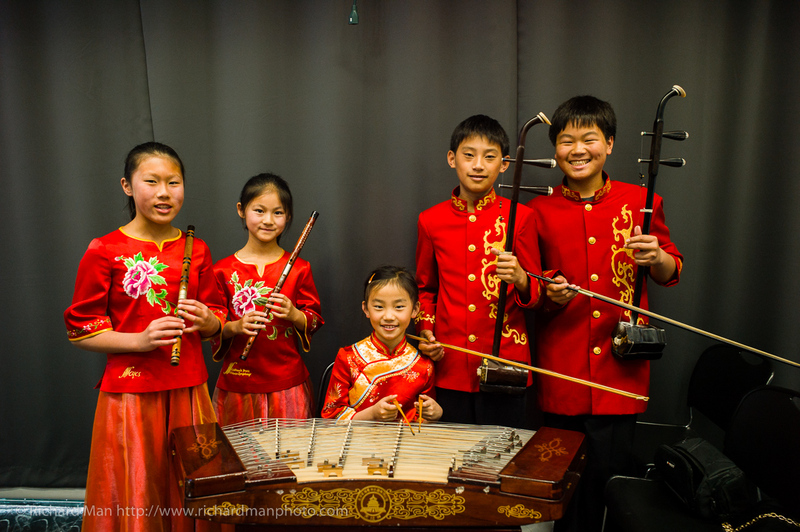 The awesomely talented Emily, Elaine, Maggie, Justin, Bill of the California Youth Chinese Symphony. Photo by Richard Man. A huge thank you to Toby, April’s fiancee, for bar tending and taking very seriously my notes about keeping the gluten-free goodies away from the cake. Also, many thanks to my friend Jennifer and her family and to my friend Pam for volunteering to help behind the scenes at the last minute. Here’s me with Jennifer and her adorable daughter Lauren, who has the distinction of being the youngest person at the party. Emily seeing Jennifer’s daughter Lauren for the first time! Photo by Richard Man. 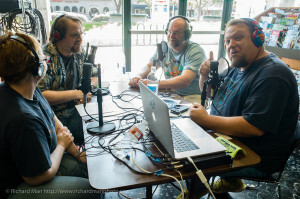 Thank you special guests JC, Chuck, and Noah of the NerdVana Podcast! They covered our entire party and interviewed April and me, and several other friends. Mrs. Jerry & Ken being interviewed by Chuck & JC. Photo by Richard Man. 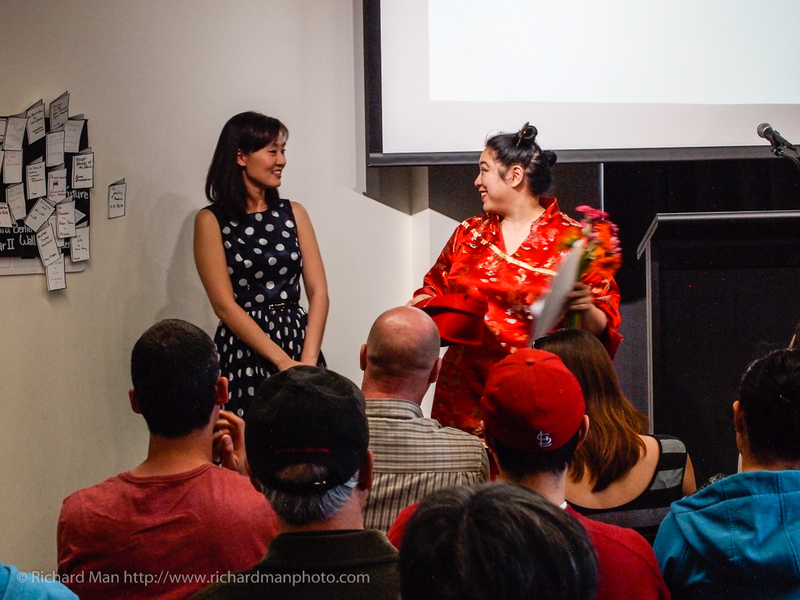 Thank you, Yiting, for singing “Jasmine Flower Song” with me! (Note the singing of the folksong was planned but did not actually happen because the autograph session was 2 hours). We met while singing in the Peninsula Women’s Chorus (PWC) and she’s the Marketing Chair. She has all these postcards for our next concerts in May, so pick one up from her! This wonderful Chinese-inspired costume was made by my friend Anna Chase, who is a professional seamstress, and she is always open to more clients. Anna is also a trained actor and singer, and she currently sings with the PWC. 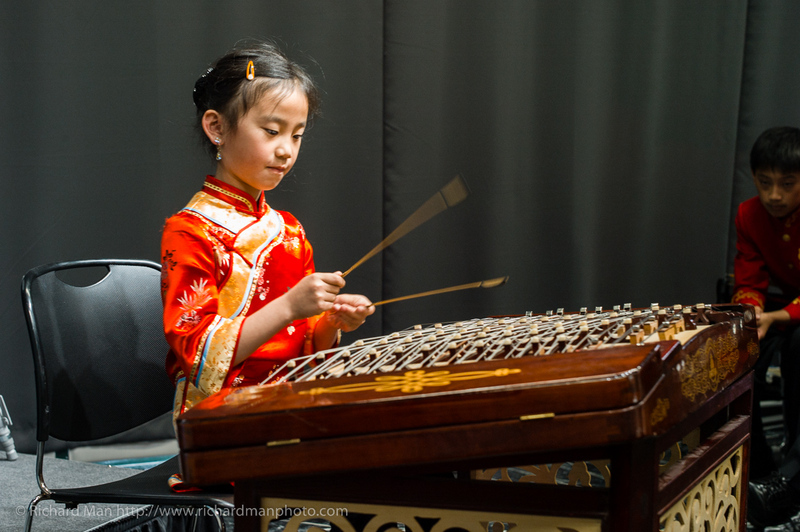 Thank you, Bea Fanning, another wonderful PWC singer, for being an early enthusiastic supporter and introducing me to a classroom where I could hear first hand these talented little girls playing the guzheng. I learned from then the power of children playing music! In fact, there are many wonderful women who are current singers and alums of the Peninsula Women’s Chorus. So feel free to ask any of them about the concerts! I’d like to thank my wonderful family here, my mom, my aunts, my uncle, and my cousin. 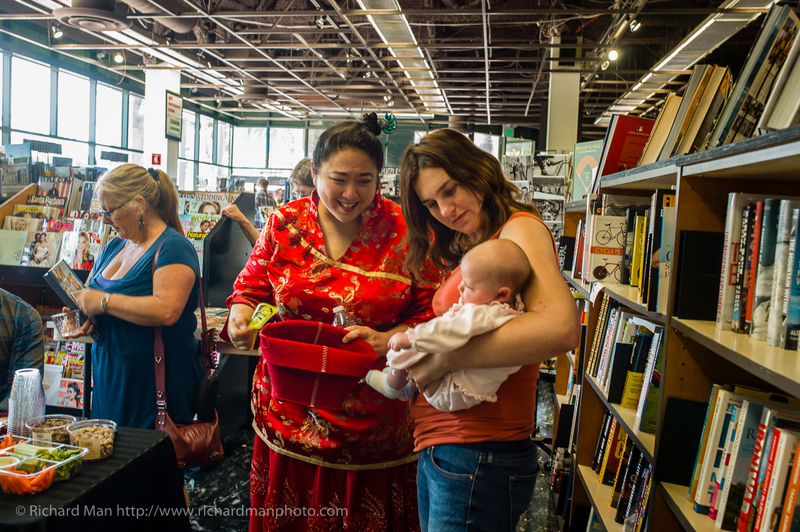 Also, April’s wonderful family, who attended our first book party, are also here for our second one! Richard Man photographer in action. Photo by Adam Lasnik. 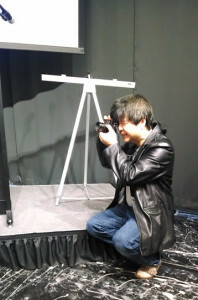 Thank you Richard Man and his wife Chris for officially taking pictures. For those of you interested in children’s music and arts education, I’d like to inform you that the California Youth Chinese Symphony offers classes over the summer. There’s a $40 registration fee and a $50-$80 rental fee, but the classes themselves are free for six weeks. Talk to Duny! Maggie, Justin, Bill all warming up before the party. Photo by Adam Lasnik. Another wonderful local youth arts education organization is The Society of Young Inklings. They bring in local authors to teach creative writing to school children, and they publish a wonderful anthology and have writing contests. If you want your kids or grandkids to become more creative writers, I highly recommend you check them out. The founder of The Society of Young Inklings, Naomi Kinsman, is also my Regional Advisor for the Society of Children’s Book Writers and Illustrators (SCBWI) in San Francisco and the Peninsula, and she has generously arranged for the first SCBWI Smooze on the Peninsula to start right after this party. As soon as I finish signing books, please join me in the cafe next door! April & Emily thanks everyone at Kepler’s! Photo by Richard Man. Finally, thank you all for showing up! I was expecting 40-50 people, but ultimately about 100 of you are here. We packed the house at Kepler’s and sold out of their stock within the first 30 minutes! Now they’re selling the two boxes of books that I brought (which nearly sold out, since in the end there were only 2 books left). I’d also like to thank everyone in spirit who couldn’t make it but are supporting us with their purchases and good thoughts. 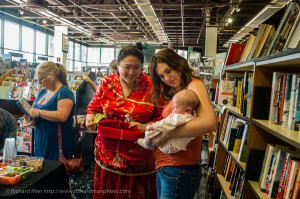 When I first arrived here this morning, the staff at Kepler’s all told me that they sold several books already to people who wanted to make it to the party but couldn’t. I’m so overwhelmed by the outpouring of love and support and I just want to thank everyone for making my Kepler’s book launch a fantastic success! 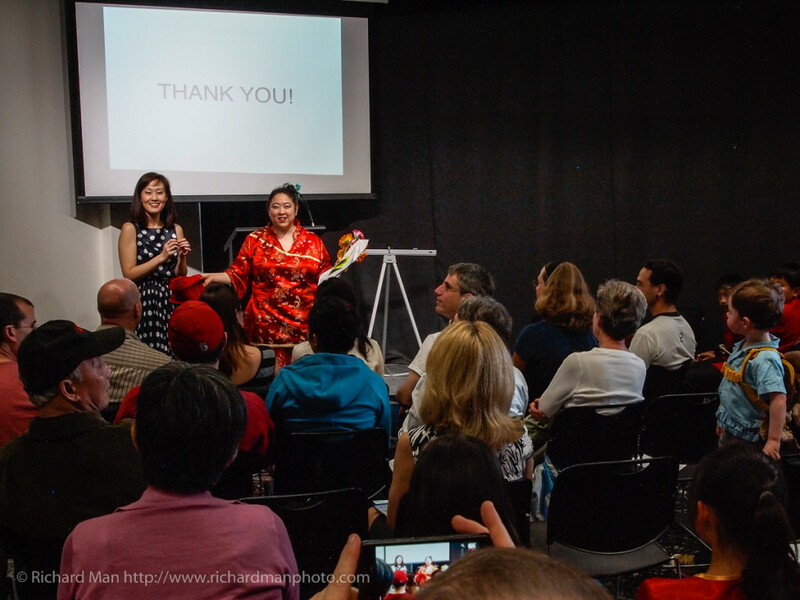 Though my original plans for the party went off schedule, the reality of my first book launch party at Kepler’s was greater than I could have ever imagined, and I am so very grateful. BUT THE PARTY ISN’T OVER YET! 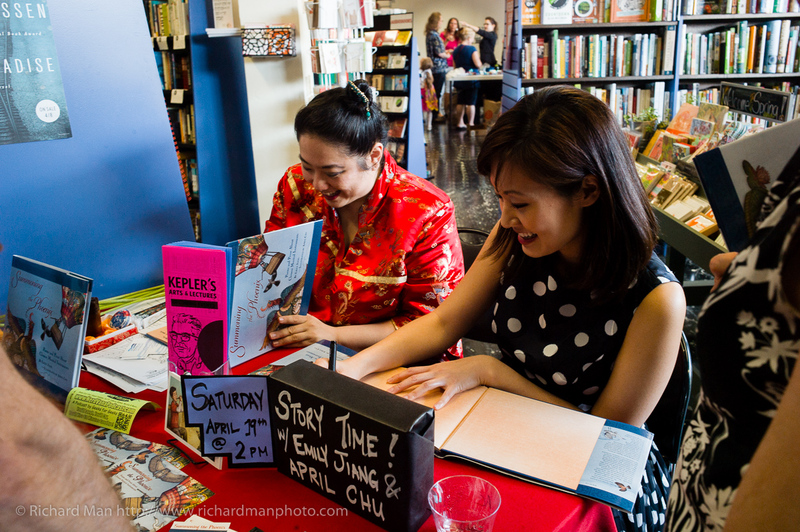 and FINAL BOOK PARTY will be at Hicklebee’s in San Jose! Join us for more awesome! Next Next post: Review for Summoning the Phoenix in Foreword Reviews!